For weeks, high-profile protests at college campuses across the country have forced schools to have uncomfortable conversations about race and diversity. The nation’s unrest over campus inclusion reached UNLV on Tuesday when more than 200 students spent nearly six hours angrily confronting administrators with a barrage of requests to boost minority services, demanding things such as a multicultural center and more professors of color. The students said they banded together to address diversity deficits they believe to be common at colleges nationwide — a concern thrust into the national spotlight by protests over racial tensions at the University of Missouri, which led to the resignation of two top administrators this month. 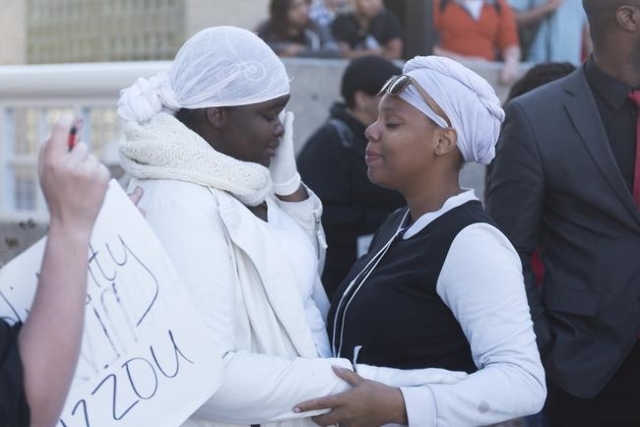 Experts say the Missouri ouster has emboldened students nationwide to air long-simmering concerns, spawning a wide-scale movement raising difficult questions about the way universities serve underrepresented groups. Tuesday’s gathering was rare for UNLV, a commuter campus where students seldom hold large-scale protests. Impressed by the turnout, area activists say they’re hopeful that national momentum will buoy efforts to better accommodate students of color at UNLV, whose undergraduate base is listed as one of the country’s most diverse by U.S. News & World Report. 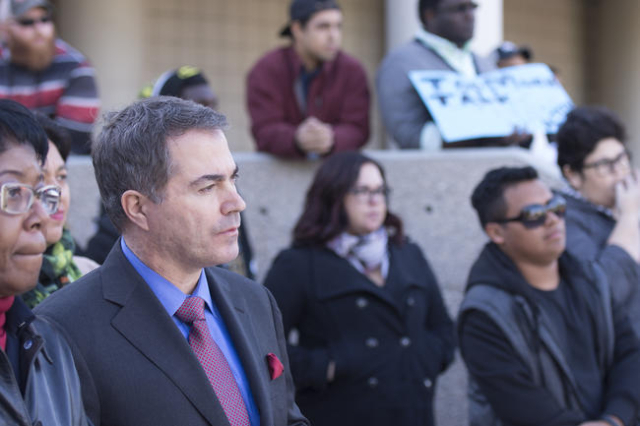 UNLV administrators in recent years have launched a number of diversity initiatives that Jessup highlighted in a campuswide memo ahead of Tuesday’s rally. UNLV Chief Diversity Officer Rainier Spencer has also spent months reviewing perennial concerns about perceived ties between UNLV’s mascot and the pro-slavery Confederate Army. The rally again exposed tensions over the mascot this week when protesters decried Hey Reb! as racist, and two UNLV graduates criticized their concerns through a pro-mascot petition. The protest also drew complaints from alumnus Kelly Fontes, 41, who said the group was wrong to ride on the coattails of a movement sparked by “deep-seated racism” in Missouri. Fontes, who is Hispanic, said he thinks UNLV is highly inclusive, although he empathizes with some of the group’s concerns, such as bolstering services for low-income college students. 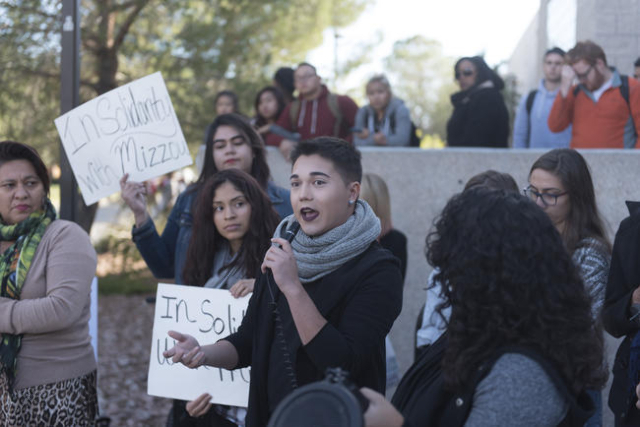 Still, the students who gathered in front of UNLV’s Lied Library Tuesday afternoon seemed largely unimpressed with the school’s existing diversity efforts, and they pelted Jessup with accusations that he hasn’t prioritized their needs enough. In his March report, diversity consultant Damon Williams — who serves as a senior vice president at the Atlanta-based Boys & Girls Clubs of America — proposed a potential restructuring of the school’s diversity office and a campuswide vision that better acknowledges the school’s role as a community leader serving an increasingly multicultural student population, among other suggestions. UNLV’s dominant vision — which came under fire at Tuesday’s rally by junior Ashley Smith — has long hinged on efforts to boost the school’s reputation as a research institution. Over two decades, five presidents have set lofty goals to get UNLV to the nation’s higher education big leagues with hopes of bringing in more competitive students, more experienced faculty and more funding. More than half of all undergraduate students at UNLV report being part of a racial or ethnic minority, and the school caters to many low-income, first-generation college students. Experts warn that its push for prestige could counter efforts to make college attainable for the region’s underserved communities. Driven by the nation’s intensifying focus on campus inclusion, change could be coming at UNLV. School administrators, led by Jessup and interim Provost Nancy Rapoport, plan to meet again with the students in coming months to address dozens of demands calling for changes affecting everything from UNLV’s curriculum to its fundraising strategy. The school could follow the lead of other universities that have implemented changes requested by students, such as USC, which announced Monday that it would direct new funds, launch discussion forums and appoint several key staff members to launch efforts to increase inclusion efforts. Even before Tuesday’s UNLV protest, Nevada’s higher education officials had their eyes on the unrest brewing nationwide. Reacting to the Missouri protests, officials at the Nevada System of Higher Education assembled a report last week comparing the system’s inclusion strategy to Missouri’s. The report, requested by system Chancellor Dan Klaich, was sent to top university officials and NSHE’s 13-member Board of Regents. Wayne Brekhus, a sociology professor at the University of Missouri, has observed other institutions react to the tension that boiled over on his campus and says the collective unrest has prompted many top-ranking higher education officials to put their inclusion efforts on display in recent weeks.